If you want to apply for a job as a Preschool Teacher, use our free Preschool Teacher Resume sample. Download for free and use it as a reference or copy and paste your information over the example info. Or, if you are short on time, try out our easy-to-use resume builder and create one in minutes. Looking for a different job? See our other resume examples here. 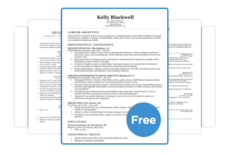 Need a different resume template? We have a huge template collection, all free to download. 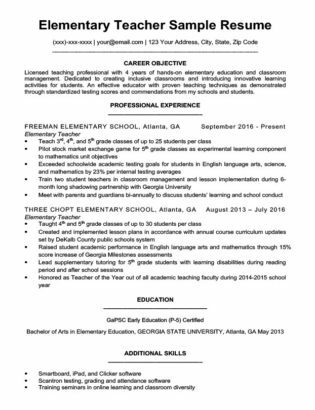 Our Preschool Teacher Resume Sample is composed in the chronological format, but you can use different formats to craft the best resume for you. If you want to learn more about how resume formats work, read our handy guide and get started on your custom document. Also, take a look at our Preschool Teacher Cover Letter Sample to finish up that application. Finally, if you are looking for a different type of teaching, maybe start with our English Tutor Resume Sample instead. You have permission to copy and paste this template into a Microsoft Word document, then edit the bullet points to reflect your own experience. Ready to move on? Check out our expansive cover letter collection for some helpful pointers. Pre-kindergarten teacher with 7 years of hands-on, classroom experience. Have taught and managed classes of up to 22 students (with assistant teacher support). Noted for my capacity for helping young learners develop healthy socialization and behavioral patterns, as well as instilling confidence and a sense of independence. Possess strong communication and collaboration capacities with parents and families in regard to student development. To write your own custom Preschool Teacher Resume, use the advice in this section. If you’re a student or fresh graduate, you will want to emphasize work experience as a student and your education. As such, you should choose a chronological format to best highlight these features. However, if you have years of early childhood education experience, consider a combination style. This can still show off your years of experience, but you’ll also be able to display your achievements and accolades. As a teacher of any sort, you will need to clearly communicate concepts to your students. This is doubly true with young learners. You must be able to break down the simplest of topics into their components and be able to both verbalize and demonstrate these ideas to people who literally have difficulty sitting still. Furthermore, you will need to write lesson plans, talk to parents, and coordinate with fellow teachers and administrators. You will need to be able to analyze each students’ strengths and weaknesses and then ascertain how to best instruct them. As a preschool teacher, communication is your prime skill. Most states have certification requirements for primary and secondary teachers, but whether or not preschool teachers need state certification depends on where you are. Be sure you have all of the necessary certifications to provide the best education for your students. However, even if you don’t need official licensing, you still want to get a certificate of some sort. There are a number of resources to help get you on your way. Be sure to find the right certificate for the job you want, and watch the job offers roll in. Almost as important as communication is the ability to manage a classroom. You need to be both authoritative and kind, firm but compassionate. This can take serious practice, and can mean the difference between a good class and a nightmare one. Be sure you have cultivated strategies to both keep students’ attention and to ensure they maintain behavior even if every moment isn’t the most exciting. There are tons of resources available to help, so be sure to read up. Make sure you use serifed fonts with other serifed fonts. Job titles should be bigger or bolder than job responsibilities. With all these tips, you should be ready to get started on your own resume. Be sure to put your contact info first, with your name being the largest item on the entire document. Consider including an introduction – something like a qualifications summary or a career objective. Then, depending on your format, place your work history, education, and skills section. Remember to make sure your resume looks clean. Make sure you use serifed fonts with other serifed fonts. Job titles should be bigger or bolder than job responsibilities. And always make sure to put the dates you worked at a company next to the job. Be sure to differentiate between different sections with lines or other markers. Don’t forget to add any educational associations you are a member of to your resume. And with that, you’re ready to build your own Preschool Teacher resume. For more information, check out our resume formats, templates, and writing guides. You can also look at our sample guide above for reference. Best of luck! Admiring the hard work you put into your site and in depth information you provide. It’s great to come across a blog every once in a while that isn’t the same out of date rehashed information. Great read! I’ve bookmarked your site and I’m including your RSS feeds to my Google account.